Below is the 2018 season recap for the Los Angeles Rams. 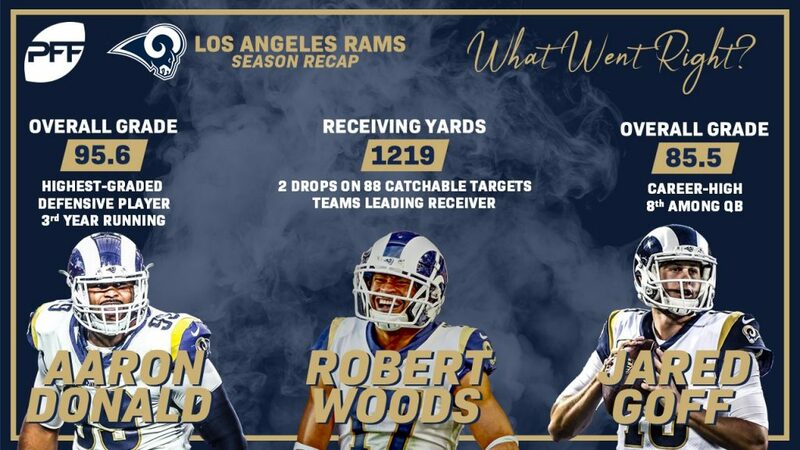 The Rams were one of the best teams in the league in 2018, earning the No. 2 seed and winning the NFC before a 13-3 Super Bowl loss to the New England Patriots. 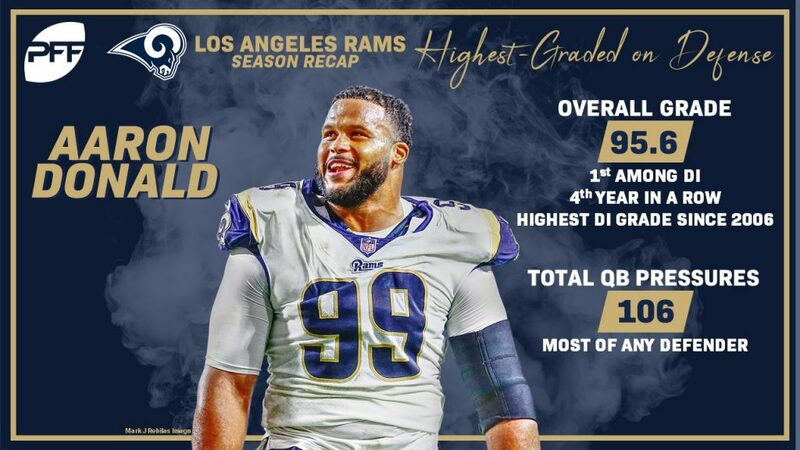 Aaron Donald was dominant again in 2018, finishing as the league’s highest-graded defensive player for the third year in a row. Donald finished with 21 sacks while amassing an astonishing 106 total pressures. Jared Goff took another step forward in his third NFL season, finishing with a career-high grade of 85.5. 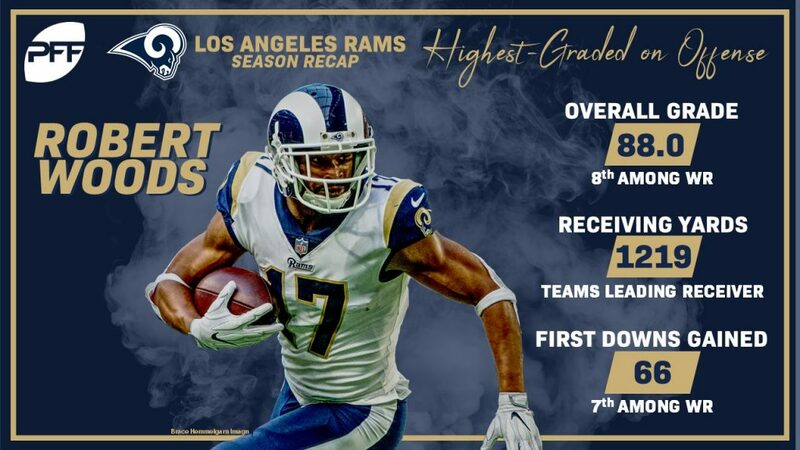 Robert Woods broke out this season, emerging as the team’s leading receiver with 1,219 receiving yards while only dropping two of his 88 catchable targets. Newly acquired CB Marcus Peters struggled in 2018, finishing with an NFL passer rating allowed of 109.9. Peters’ overall grade of 60.1 was down 20.6 points from just a season ago. 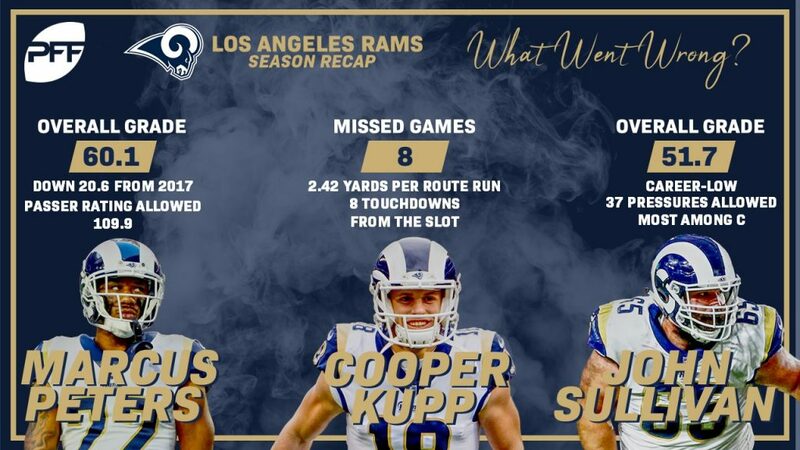 In a year where not much went wrong offensively, losing WR Cooper Kupp due to an ACL injury was a tough loss for the Rams. From the slot, Kupp averaged a whopping 2.42 yards per route run and hauled in five touchdowns over the course of eight games. Despite starting all 16 games, veteran center John Sullivan turned in the lowest overall grade of his career at 51.7. Particularly in pass blocking, Sullivan struggled and allowed 37 total pressures, the most of any center in the league. Woods posted the highest grade on offense as he emerged as one of the league’s best possession receivers. His 66 first downs ranked seventh in the NFL. It’s no surprise that Donald had the best grade on the defensive side and he’s now been the top-graded interior defensive lineman in the league over the last four seasons. His 95.6 mark is the best we’ve seen since 2006. 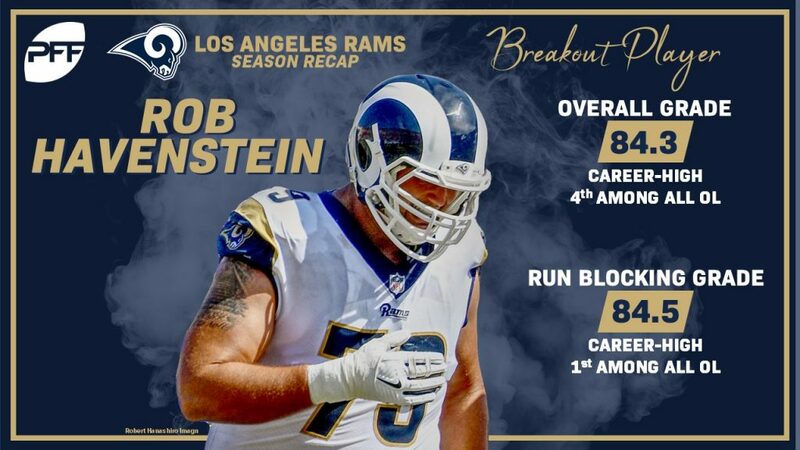 Rob Havenstein made huge strides in 2018 while starting all 16 games at right tackle for the Rams. Havenstein’s 84.3 overall grade was a career-high and the fourth-best mark among all offensive linemen in the league. Fourth-round edge defender John Franklin-Myers showed promise as a rookie despite finishing with an overall grade of 63.8. Playing mostly in a pass-rush capacity, Franklin-Myers finished seventh among all rookie defenders with 21 quarterback hurries. Despite the Super Bowl loss, there’s plenty of optimism for the Rams moving forward as they have top players on both sides of the ball and they’ll be right in the mix once again in 2019.